Betsy Bowen's well-known in these parts for her woodblock prints of birds and other north woods critters. She's locally famous, too, for things that have little to do with art. There was the time, for example, when a bass player didn't show for a town band rehearsal and Bowen was recruited to fill in. She's now the go-to electric bass player for Grand Marais celebrations. "Every band needs a mom in the background," she says. She's also one of the founders of the 46-year-old Cook County Whole Foods Co-op. She refurbished an old church built by Norwegian immigrants and turned it into her studio. The ceiling beams in the basement work area are giant, peeled red pine logs. Bowen knows firsthand that small town residents fill many roles. Now in her late 60s, she's approaching what some would call retirement age. But she's not retiring. Instead, she is pushing ahead with new projects. "I just have simple tools," she said recently while working in her studio. 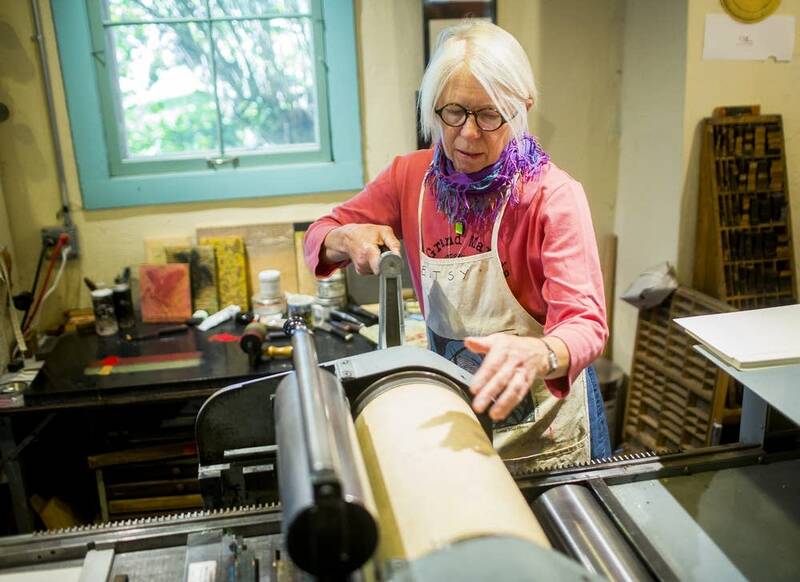 Betsy Bowen makes woodblock printing look easy. Grab a piece of white pine, an X-Acto knife, a carving tool and voila! "The ink is kind of thick and sticky, it's kind of thick like peanut butter. "Then I'll just roll it across the block, and you just do it, and do it again and again, and pretty soon you have a pile of, in this case, greeting cards." Bowen grew up in suburban Chicago. She says her parents — her father a civil engineer, her mother with a background in cartography — encouraged her art. "They filed my drawings in the, 'important place,' file. It was pretty great." Bowen was the oldest of three daughters, growing up in Hinsdale, Illinois, attending public school, taking piano, dance and violin lessons, and admiring the birds that flocked to her grandmother's feeder. She cites that memory as part of her inspiration for creating dozens of woodblock prints of northern Minnesota's winged residents. Bowen also remembers her first commission. She was 8 years old and a neighbor paid her a quarter for a collage she had created. She moved to Grand Marais, which was already a noted art colony on Lake Superior's North Shore, in the 1960s. The destination was a natural one since her parents had purchased a 40-acre homestead seven miles from town. Bowen still lives on the property, which includes a small barn and some other outbuildings. But she says she's not a farmer. A friend keeps draft horses in the barn and other friends operate a large garden on the property. Grand Marais has always attracted people drawn to the natural beauty of the North Shore. Artists began arriving in some numbers in 1947 with the arrival of Procter native Birney Quick. He started the Grand Marais Outdoor School of Painting, later, the Grand Marais Arts Colony. Quirk later became an instructor at the Minneapolis School of Art which became the Minneapolis College of Art and Design. 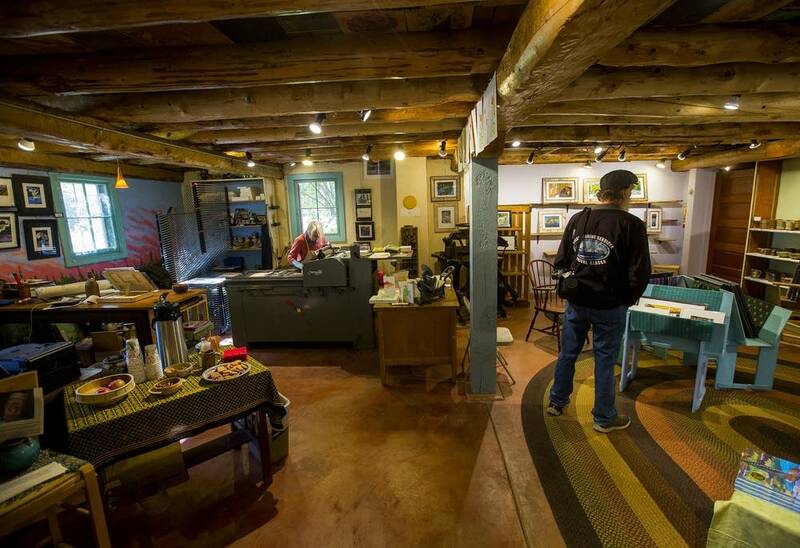 Bowen's print making studio and gallery are just up the hill from the Grand Marais harbor. 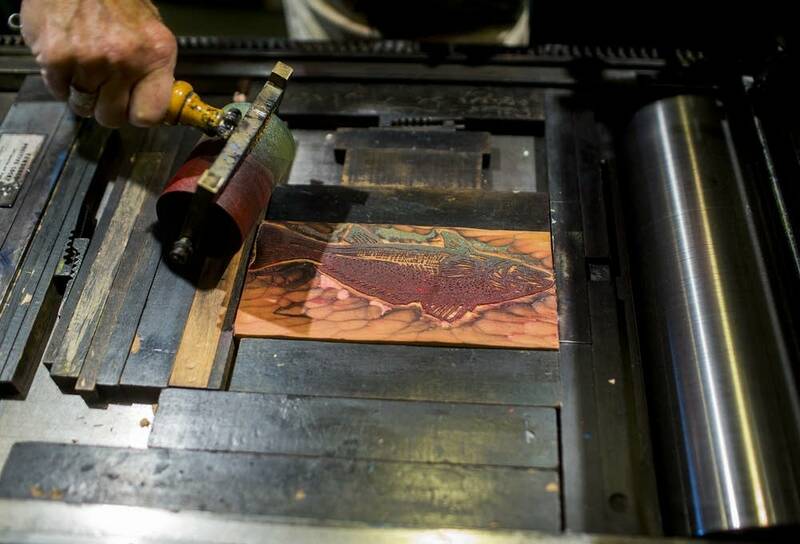 She has illustrated more than a dozen books and carved hundreds of woodblocks for prints. The most recent book is, "Plant a Pocket of Prairie," a primer for prairie preservation written by Twin Cities author Phyllis Root. Bowen says she tried something new for these illustrations. She layered woodcut prints of prairie grasses and added free-hand painting. Now, there's a new project in the works — illustrations for a book about an old growth forest in northern Minnesota known as the Lost 40, a tract that loggers bypassed because surveyors mistakenly showed it under water. Besides a supportive environment to learn her art, Bowen said the town's location supplies a vista — half lake, half sky — that binds the residents together. "Fishing, or watching the storms come in. I think that's the connector," she said. Every year Bowen and others create another connector. They observe the winter solstice with music, food and a shadow puppet show. Bowen says the story line is pretty much the same every winter: the powerful force needed to bring back the sun. The celebration helps people cope with the grumpiness that winter darkness can amplify, she added. "They have to shake off their factions for at least for a time and have to be nice to each other long enough to all sing the same song for a bit." Retirement isn't on the agenda. "If retirement meant just stopping ideas from coming, I just don't get it," she said. "I'd love to keep on, making something out of the ideas."